Definition at line 18 of file Disks.h. Definition at line 151 of file Disks.cc. Additional unknown-size entry bytes required by disks in order to reduce the risk of selecting the wrong disk cache for the growing entry. Definition at line 382 of file Disks.cc. References MemObject::availableForSwapOut(), debugs, largestMinimumObjectSize, StoreEntry::mem_obj, and secondLargestMaximumObjectSize. If Transients entry cannot be attached to this storage, return false. If the entry is not found, return false. Otherwise, return true after tying the entry to this cache and setting inSync to updateAnchored(). Definition at line 515 of file Disks.cc. References Store::Disk::active(), Store::Controlled::anchorToCache(), SquidConfig::cacheSwap, Config, debugs, Dir(), and Store::DiskConfig::n_configured. Definition at line 173 of file Disks.cc. References SquidConfig::cacheSwap, Store::Storage::callback(), Config, fatal(), i, Store::DiskConfig::n_configured, and store(). Definition at line 205 of file Disks.cc. References SquidConfig::cacheSwap, Config, Store::Disk::create(), DBG_CRITICAL, DBG_PARSE_NOTE, debugs, Dir(), i, Store::DiskConfig::n_configured, and store(). Definition at line 339 of file Disks.cc. References SquidConfig::cacheSwap, Config, Store::Storage::currentCount(), Dir(), i, Store::DiskConfig::n_configured, and store(). Definition at line 326 of file Disks.cc. References SquidConfig::cacheSwap, Config, Store::Storage::currentSize(), Dir(), i, Store::DiskConfig::n_configured, and store(). Definition at line 454 of file Disks.cc. Definition at line 165 of file Disks.cc. Referenced by anchorToCache(), create(), currentCount(), currentSize(), evictIfFound(), hasReadableEntry(), init(), maxSize(), minSize(), SmpAware(), updateAnchored(), and updateLimits(). Definition at line 489 of file Disks.cc. References StoreEntry::disk(), EBIT_TEST, Store::Storage::evictCached(), evictIfFound(), StoreEntry::flags, StoreEntry::hasDisk(), KEY_PRIVATE, StoreEntry::publicKey(), storeDirSwapLog(), and SWAP_LOG_DEL. Definition at line 506 of file Disks.cc. References SquidConfig::cacheSwap, Config, Dir(), Store::Storage::evictIfFound(), i, and Store::DiskConfig::n_configured. Referenced by evictCached(), and Store::Controller::evictIfFound(). a possibly unlocked/unregistered stored entry with key (or nil) The returned entry might not match the caller's Store ID or method. The caller must abandon()/release() the entry or register it with Root(). This method must not trigger slow I/O operations (e.g., disk swap in). Definition at line 218 of file Disks.cc. References Store::Disk::active(), SquidConfig::cacheSwap, Config, debugs, Store::Disk::get(), INDEXSD, Store::DiskConfig::n_configured, and storeKeyText(). Definition at line 419 of file Disks.cc. References SquidConfig::cacheSwap, Config, Store::Disk::getStats(), i, Store::DiskConfig::n_configured, StoreInfoStats::Swap::open_disk_fd, store(), store_open_disk_fd, and StoreInfoStats::swap. Definition at line 561 of file Disks.cc. References SquidConfig::cacheSwap, Config, Dir(), i, and Store::DiskConfig::n_configured. Definition at line 244 of file Disks.cc. References SquidConfig::avgObjectSize, buckets, SquidConfig::cacheSwap, Config, DBG_IMPORTANT, debugs, Dir(), fatal(), hash_create(), i, Store::Storage::init(), maxSize(), Store::Controller::maxSize(), SquidConfig::memMaxSize, SquidConfig::memShared, Store::DiskConfig::n_configured, SquidConfig::objectsPerBucket, Store::Root(), store(), SquidConfig::Store, SquidConfig::store_dir_select_algorithm, store_hash_buckets, store_table, storeDirSelectSwapDir, storeDirSelectSwapDirLeastLoad, storeDirSelectSwapDirRoundRobin, storeKeyHashBuckets(), storeKeyHashCmp, and storeKeyHashHash. Definition at line 467 of file Disks.cc. References SquidConfig::cacheSwap, Config, i, Store::Disk::maintain(), Store::DiskConfig::n_configured, and store(). Definition at line 352 of file Disks.cc. 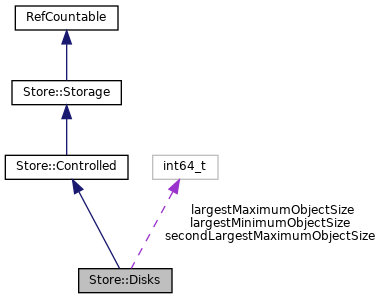 Referenced by Store::Controller::maxObjectSize(), and Store::Controller::updateLimits(). Definition at line 300 of file Disks.cc. References SquidConfig::cacheSwap, Config, Dir(), i, Store::Disk::maxSize(), Store::DiskConfig::n_configured, and store(). Referenced by init(), and Store::Controller::maxSize(). Definition at line 313 of file Disks.cc. References SquidConfig::cacheSwap, Config, Dir(), i, Store::Disk::minSize(), Store::DiskConfig::n_configured, and store(). Definition at line 448 of file Disks.cc. Definition at line 548 of file Disks.cc. Definition at line 435 of file Disks.cc. References SquidConfig::cacheSwap, Config, i, Store::DiskConfig::n_configured, Store::Disk::stat(), store(), and storeAppendPrintf(). Definition at line 159 of file Disks.cc. Referenced by callback(), create(), currentCount(), currentSize(), getStats(), init(), maintain(), maxSize(), minSize(), stat(), and sync(). Definition at line 482 of file Disks.cc. References SquidConfig::cacheSwap, Config, i, Store::DiskConfig::n_configured, store(), and Store::Storage::sync(). Update a local Transients entry with fresh info from this cache (if any). Return true iff the cache supports Transients entries and the given local Transients entry is now in sync with this storage. Definition at line 541 of file Disks.cc. References Dir(), StoreEntry::hasDisk(), StoreEntry::swap_dirn, and Store::Controlled::updateAnchored(). Definition at line 460 of file Disks.cc. References StoreEntry::disk(), Must, and Store::Controlled::updateHeaders(). Definition at line 358 of file Disks.cc. References SquidConfig::cacheSwap, Config, Dir(), i, largestMaximumObjectSize, largestMinimumObjectSize, Store::DiskConfig::n_configured, and secondLargestMaximumObjectSize. Definition at line 62 of file Disks.h. Referenced by maxObjectSize(), and updateLimits(). Definition at line 61 of file Disks.h. Referenced by accumulateMore(), and updateLimits(). Definition at line 63 of file Disks.h.